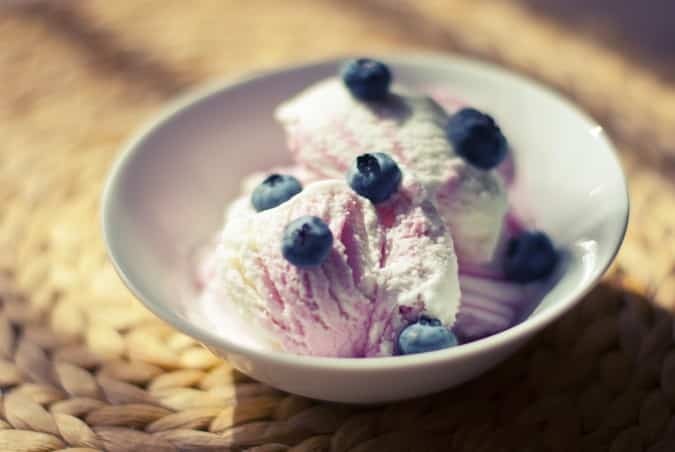 Last summer, some of my friends made some blueberry ice cream that was just amazing. It was made with whole milk and fresh blueberries, sweetened with honey, and was absolutely fabulous. This summer, I decided to try it, but ended up making frozen yogurt instead. I’m lactose intolerant, so I can only do a very small amount of ice cream before I end up regretting my decision. Starting with yogurt and making frozen yogurt seemed like a great alternative. And it was. I started with fat free Greek yogurt. It provided a delicious and creamy base for the dessert, but without the fat. I used plain yogurt since I wanted to add a bit of honey for flavor, and the vanilla was easy enough to add as well. I used my frozen yogurt and sorbet maker from Cuisinart, but you can use any ice cream maker you have. Alternatively, just stick the mixture in the freezer and you’ll end up with a very tasty dessert just as easily as you would have with an ice cream maker. The whole family (and friends and neighbors!) will love this sweet treat this summer. Cool down with a refreshing, creamy and delicious blueberry frozen yogurt. In a saucepan, combine the honey, vanilla, 4 oz blueberries, lemon juice and lemon zest. Cook over medium heat until the honey is completely dissolved and the berries burst. Remove from heat and refrigerate the mixture until cool. Once cool, combine the honey mixture, remaining blueberries and yogurt. Freeze the yogurt according to the directions of your ice cream or yogurt maker. Alternatively, freeze in a container until solid.